Olga AUNOVSKA Seeds of fraternity. 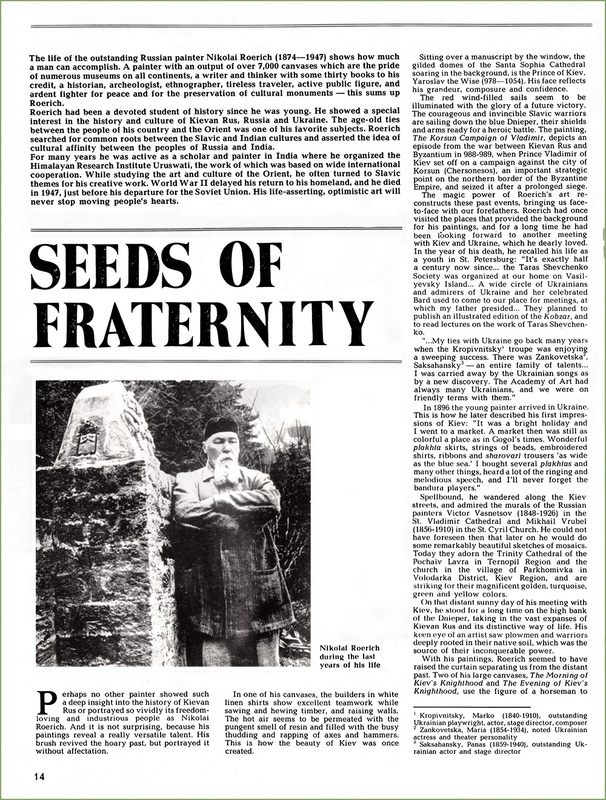 Aunovska O. K. (1985) Seeds of fraternity. 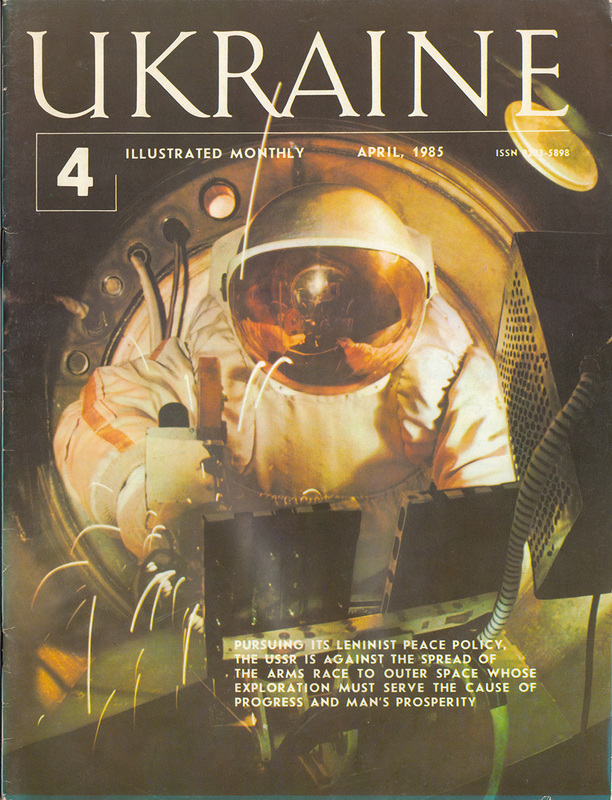 Ukraine : 4 : 14-15. The life of the outstanding Russian painter Nikolai Roerich (1874—1947) shows how much a man can accomplish. A painter with an output of over 7r000 canvases which are the pride of numerous museums on all continents, a writer and thinker with some thirty books to his credit, a historian, archeologist, ethnographer, tireless traveler, active public figure, and ardent fighter for peace and for the preservation of cultural monuments — this sums up Roerich. Roerich had been a devoted student of history since he was young. He showed a special interest in the history and culture of Kievan Rus, Russia and Ukraine. The age-old ties between the people of his country and the Orient was one of his favorite subjects. Roerich searched for common roots between the Slavic and Indian cultures and asserted the idea of cultural affinity between the peoples of Russia and India. For many years he was active as a scholar and painter in India where he organized the Himalayan Research Institute Uruswati, the work of which was based on wide international cooperation. While studying the art and culture of the Orient, he often turned to Slavic themes for his creative work. World War II delayed his return to his homeland, and he died in 1947, just before his departure for the Soviet Union. His life-asserting, optimistic art will never stop moving people's hearts. Perhaps no other painter showed such a deep insight into the history of Kievan Rus or portrayed so vividly its freedom-loving and industrious people as Nikolai Roerich. And it is not surprising, because his paintings reveal a really versatile talent. His brush revived the hoary past, but portrayed it without affectation. In one of his canvases, the builders in white linen shirts show excellent teamwork while sawing and hewing timber, and raising walls. The hot air seems to be permeated with the pungent smell of resin and filled with the busy thudding and rapping of axes and hammers. This is how the beauty of Kiev was once created. Sitting over a manuscript by the window, the gilded domes of the Santa Sophia Cathedral soaring in the background, is the Prince of Kiev, Yaroslav the Wise (978—1054). His face reflects his grandeur, composure and confidence. The red wind-filled sails seem to be illuminated with the glory of a future victory. The courageous and invincible Slavic warriors are sailing down the blue Dnieper, their shields and arms ready for a heroic battle. The painting, The Korsun Campaign of Vladimir, depicts an episode from the war between Kievan Rus and Byzantium in 988-989, when Prince Vladimir of Kiev set off on a campaign against the city of Korsun (Chersonesos), an important strategic point on the northern border of the Byzantine Empire, and seized it after a prolonged siege. The magic power of Roerich's art reconstructs these past events, bringing us face-to-face with our forefathers. Roerich had once visited the places that provided the background for his paintings, and for a long time he had been looking forward to another meeting with Kiev and Ukraine, which he dearly loved. In the year of his death, he recalled his life as a youth in St. Petersburg: "It's exactly half a century now since... the Taras Shevchenko Society was organized at our home on Vasilyevsky Island... A wide circle of Ukrainians and admirers of Ukraine and her celebrated Bard used to come to our place for meetings, at which my father presided... They planned to publish an illustrated edition of the Kobzar, and to read lectures on the work of Taras Shevchenko. "...My ties with Ukraine go back many years when the Kropivnitsky* troupe was enjoying a sweeping success. There was Zankovetska**, Saksahansky*** — an entire family of talents... I was carried away by the Ukrainian songs as by a new discovery. The Academy of Art had always many Ukrainians, and we were on friendly terms with them." In 1896 the young painter arrived in Ukraine. This is how he later described his first impressions of Kiev: "It was a bright holiday and I went to a market. A market then was still as colorful a place as in Gogol's times. Wonderful plakhta skirts, strings of beads, embroidered shirts, ribbons and sharovari trousers 'as wide as the blue sea.' I bought severed plakhias and many other things, heard a lot of the ringing and melodious speech, and I'll nevei forget the bandura players." Spellbound, he wandered along the Kiev streets, and admired the murals of the Russian painters Victor Vasnetsov (1848-1926) in the St. Vladimir Cathedral and Mikhail Vrubel (1856-1910) in the St. Cyril Church. He could not have foreseen then that later on he would do some remarkably beautiful sketches of mosaics. Today they adorn the Trinity Cathedral of the Pochaiv Lavra in Ternopil Region and the church in the village of Parkhomivka in Volodarka District, Kiev Region, and are striking for their magnificent golden, turquoise, green and yellow colors. On that distant sunny day of his meeting with Kiev, he stood for a long time on the high bank of the Dnieper, taking in the vast expanses of Kievan Rus and its distinctive way of life. His keen eye of an artist saw plowmen and warriors deeply rooted in their native soil, which was the source of their inconquerable power. With his paintings, Roerich seemed to have raised the curtain separating us from the distant past. Two of his large canvases, The Morning of Kiev's Knighthood and The Evening of Kiev's Knighthood, use the figure of a horseman to symbolize the strength of the whole people. Such a warrior would not hesitate to give up his life to defend his native land. SS Boris and Gleb shows Prince Vladimir's sons who were killed on the order of their treacherous brother Svyatopolk, and is a recurrent subject of Roerich's creations. Boris and Gleb attracted the artist by their honesty and their striving for unity, which alone would make Kievan Rus a strong state. It was no coincidence that he turned to this same subject during the trying time of the Soviet people's victorious battle against fascism. Roerich's cycle of canvases The Beginning of Rus. The Slavs was conceived to express great philosophical generalizations and shows the painter's deep insight into the past. Among them are his Idols which transports us into the times of paganism, The Messenger, Meeting of Elders, Building Boats, The Slavs on the Dnieper, and Ancient Rus. His Svyatogor and Nastasia Mikulichna are highly patriotic in their message. His pictures not only portray his vision of the past, but they also teach us to understand and love it, to build a joyous present day, and to struggle for peace and a happy tomorrow. "Here, in the Himalayas, while listening to A Zaporozhian Cossack Beyond the Danube**** over the air, I see vivid pictures of Ukraine passing before my eyes. I see Shevchenko and Gogol, and friendship, a heartfelt brotherly love blends with the consonance of Ukraine's melodies." Next come Roerich's prophetic words: "Yes, the fraternity of peoples is a great boon! Wherever this fertile seed will fall, it will certainly give life to thoughts of peace, cooperation, heroism, and self-sacrifice. It is my wish that this seed of fraternity be planted." The note ends with the words: "My love and regards to Ukraine, and most hearty greetings from the Himalayas to the peoples of the whole Union." A true patriot, Nikolai Roerich rejoiced over every success of his homeland: "In the mighty stream of progress, the Union of peoples accomplished an unprecedented victory. A great magnet has appeared for good work... Reunification is occuring. Ancient 'Galician Ruthenia' has joined her elder sister; 'Precarpathian Ruthenia' and Bukovina have followed suit... In these far-away snow-clad Himalayas, we are glad that the great Rus is the victor, having first of all in mind the triumph oi science, creative endeavor, and the ties common to all mankind." As heralds of genuine beauty, Nikolai Roerich's paintings serve to strengthen these ties.